I think it looks purry tasty! 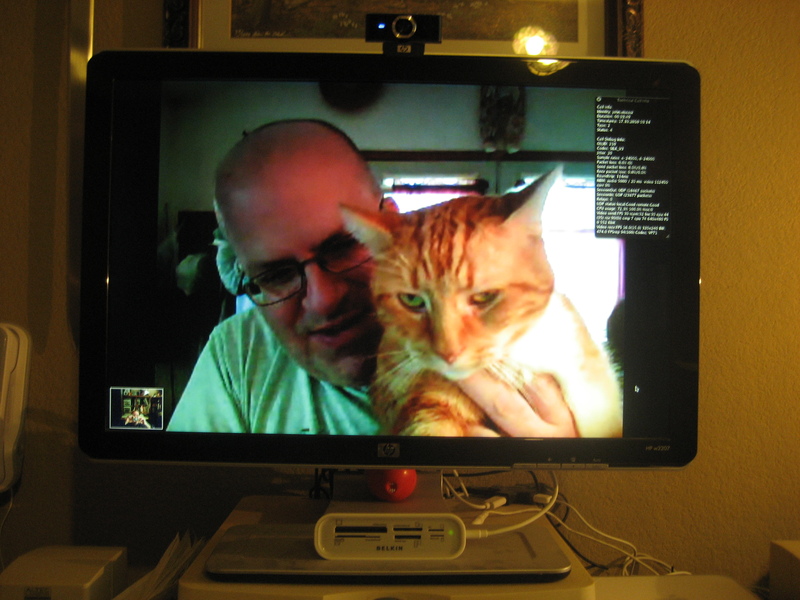 Skyping Kitties! I see you kitty kitty…. This picture scares me. On so many levels. Seriously. But anyhoo…. ‘Zoom-zoom’ won as my new tag line (heh… that’s what you get for not even knowing you entered, huh?)!!! Mom and Dad are excited as that’s the one they were rooting for, and might have resorted to a little vote tampering if it had been necessary (but it wasn’t…). Sooo… since Mom’s brain doesn’t retain information for very long, could you please send her the information on your charity so she can get the donation out to them, please?!? Thanks! And thanks for my new tag line – with the snow zoomies, it’s perfect! Now I wants to Skype! Oh no, Dennis, looks like a Trouble in disguise. Hello there, kitteh! You sure don’t looks happy. I hope your owner sleeps with one eye open tonight. That cat has crazy eyes! *snicker* I suspect the cat’s expression might have something to do with the fact that his view was of that camera in his face! He must not be a fan of papparazzi! You crazy California people! Wah look at those green, green eyes! Yikes. I think Mr. Kitty will have to start sleeping in the cellar. Oh Dennis, that is one scary kitty! Or maybe it is just looking that way for Halloween….! Ummm… Maybe you ought to put that cat down. It doesn’t look so happy…. What is that kitty trying to say to you? creepy came early this year! yikes!